Weight : 15g. 12 hour lasting self-tatoo lip makeup. CHERRY RED. It is good to apply lip balm or transparent gloss after that. After 5 minutes of waiting, lip tatoo is completed. Various color choices for various mood ; Red, Orange, Pink. Weight : 15g. PLUM PURPLE. 12 hour lasting self-tatoo lip makeup. It is good to apply lip balm or transparent gloss after that. After 5 minutes of waiting, lip tatoo is completed. Various color choices for various mood ; Red, Orange, Pink. Weight : 15g. 12 hour lasting self-tatoo lip makeup. 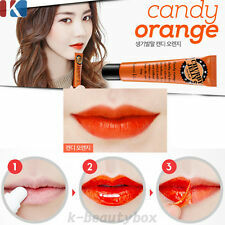 CANDY ORANGE. It is good to apply lip balm or transparent gloss after that. After 5 minutes of waiting, lip tatoo is completed. Various color choices for various mood ; Red, Orange, Pink. 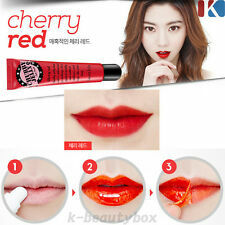 SECRET KEY 12 Hour Lip Stain Chubby Jelly Tint 15g, Cherry Red.